For the second time in two weeks, GOOG provided a textbook example of a stock finding support at its 200-day moving average. 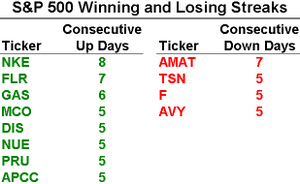 On February 15th, the stock rallied before ever reaching its 200-day, yet today, the stock actually traded at and below its 200-day (albeit for less than a minute), before rallying over 23 points (6%) and closing near 363. So for now, the 200-day moving average is acting as a floor for the stock, but as anyone who follows technical analysis will tell you, the more a stock tests support, the weaker that support becomes. Wall Street analysts are often singled out for making a bullish call near the top of a rally or saying to sell a stock right when it puts in a bottom, but as a group, they have made some good calls. 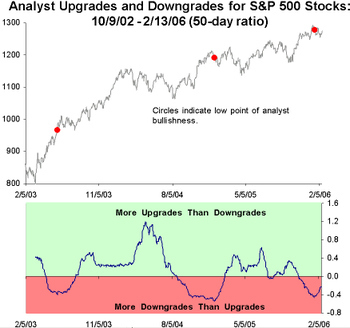 One of the indicators we monitor on a daily basis is a list of all analyst upgrades and downgrades for S&P 500 stocks. As the chart below details, since 2003, the periods where analysts have been the most bearish have usually coincided with market peaks. Before going off and selling your stocks though, we would note that the overall correlation between this indicator and the S&P 500 is a mere -0.09 which indicates little relationship between the two on a more constant basis. U.S. Treasury Bond Investors become most bullish since 2003. Under 21 is okay. Youngsters back in favor with venture capitalists. Jeff Matthews with an interesting post on How to "Beat the Quarter." More mutual funds are using hedge fund strategies. The Big Picture highlights an article on the equity risk premium in the NY Times today. Life in the Googleplex. Time takes a look inside Google's headquarters. This would probably be a little too much for me to deal with in a work environment. More Google Finance gossip found at The Stalwart. It looks like Larry Page of Google has a new main squeeze. And here is a link to the always excellent links from The Kirk Report. We also wanted to point out that as part of our Newsletter service (and all other services), we are now offering Birinyi stock scores on over 1,500 companies based on multiple Birinyi stock research methods. Please click here if you are interested. We recently sent out the March issue of Laszlo Birinyi's Reminiscences Newsletter. Below are some brief blurbs from the issue. Please visit www.Birinyi.com for more information regarding our services. Calling a Bottom in INTC? 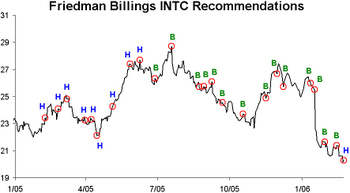 Friedman Billings downgraded INTC from Outperform to Market Perform this morning. See the chart below for their historical recommendations on INTC. 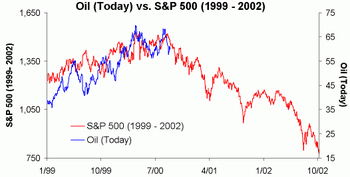 With oil falling below $60 per barrel again today, we thought it is worth noting that the commodity is tracing an eerily similar path to the S&P 500’s topping pattern in 2000, as both reached their peaks, and then failed to take out their old highs in subsequent rallies five months later. Below is a tool we frequently use to get a gauge on market as well as stock timing. Basically, this shows a stock or index's trading range on a line so we can look at many at once and see which ones stand out. The explanation key at the top will help in reading the charts. 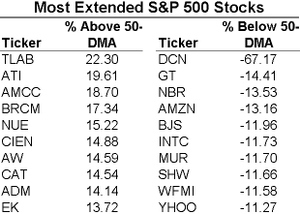 We have highlighted some of the US ETFs that currently look interesting. 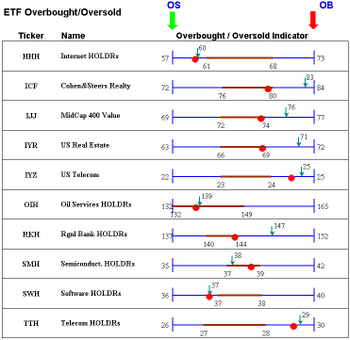 ETFs which are currently below their normal trading range (green arrow to the left of the thick brown line) are considered oversold, while stocks which are currently above their trading range (green arrow to the right of thick brown line) are considered overbought. As always, email or leave a comment if you have any questions. Is It A Level Playing Field? By now most of you are probably familar with the decline in PXRE Group (PXT) which fell $7.84 (66%) in yesterday's trading after it said losses from this summer's hurricanes would be higher than expected. Among its largest shareholders are three of the most respected hedge funds in the world, D.E. Shaw ($19 bln under management), Och-Ziff Capital Management ($10 bln under management), and Eton Park Capital Management ($3.5 bln under management). Based on their holdings as of year end 2005, the decline in PXT year to date has had a negative impact of 0.27% for D.E. Shaw, 0.41% for Och-Ziff, and a hefty 1.40% for Eton Park. To us what is most noteworthy about this story is that these hedge funds are run by some of the most successful traders in the world, and yet they were still caught holding the bag. For example, if you do a Google search on Eton Park Capital Management, the first result reads as follows: "Eton Park Capital Management: Started last year by former hot-shot Goldman Sachs proprietary trader Eric Mindich." This makes us wonder, has the playing field leveled out, or is the market just a crapshoot as the random-walkers would have us believe. In any case, we should all print out a chart of PXT and remember this story, so that the next time you wake up to see that one of your holdings is down big following a negative news event, you can take solace in the fact that it can happen to anybody.